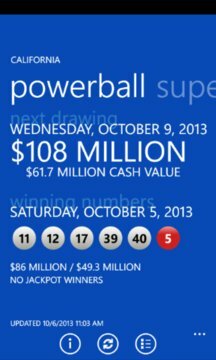 Lottery results and jackpot information for Mega Millions, Powerball, Monopoly Millionaires' Club, Hot Lotto, Wild Card 2, 2by2, Lucky for Life, and state lottery games. Arizona (AZ), Arkansas (AR), California (CA), Colorado (CO), Connecticut (CT), Delaware (DE), District of Columbia (DC), Florida (FL), Georgia (GA), Idaho (ID), Illinois (IL), Indiana (IN), Iowa (IA), Kansas (KS), Kentucky (KY), Louisiana (LA), Maine (ME), Maryland (MD), Massachusetts (MA), Michigan (MI), Minnesota (MN), Missouri (MO), Montana (MT), Nebraska (NE), New Hampshire (NH), New Jersey (NJ), New Mexico (NM), New York (NY), North Carolina (NC), North Dakota (ND), Ohio (OH), Oklahoma (OK), Oregon (OR), Pennsylvania (PA), Puerto Rico (PR), Rhode Island (RI), South Carolina (SC), South Dakota (SD), Tennessee (TN), Texas (TX), US Virgin Islands (VI), Vermont (VT), Virginia (VA), Washington (WA), West Virginia (WV), Wisconsin (WI) and Wyoming (WY). 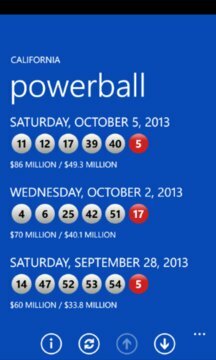 For full-featured and ad-free lotto apps, search "my lottos" for other apps from My Lottos. Please note: Version 1.3 is our last update on Windows Phone 7.x. If you are running Windows Phone 7.x, upgrade to this version is recommended.